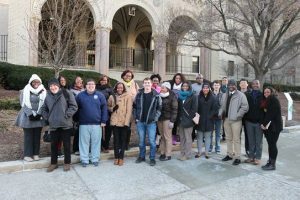 Their journey from Greensboro to Pittsburgh was funded by a diversity grant provided through the Swanson School of Engineering as part of Pitt’s Year of Diversity initiatives. Perfusion is the process of managing cardiopulmonary bypass (CPB), a technique that temporarily takes over the function of the heart and lungs during surgery, maintaining the circulation of blood and the transfer of oxygen to the body and removal of carbon dioxide. The device that supports CPB is often referred to as the heart–lung machine or “the pump.” Once CPB is initiated, the patient’s heart and lungs are stopped, providing the surgeon with a motionless, bloodless surgical field for safe and effective repair of cardiac disease. During the 2-day visit, students were exposed to clinical biomedical technologies and met with Pitt faculty, staff, and students in Pitt’s Department of Bioengineering, and Procirca’s artificial heart program and perfusion staff. 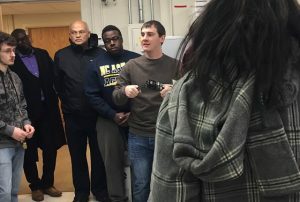 Brandon D’Aloiso, a first-year student in UPMC’s cardiovascular perfusion program and a 2016 baccalaureate from Pitt’s Department of Bioengineering, explained the perfusion circuit to the group, how it works, and how it’s connected to the native heart. The Procirca Perfusion Simulation and Education Center at UPMC Shadyside has modern cardiopulmonary bypass, extra-corporeal membrane oxygenation and ventricular assist devices that are available for use by cardiac surgical teams who treat these patients. A more complete understanding of extra-corporeal technology is gained through demonstrations, hands-on learning, and high fidelity simulation, supported with didactic training from UPMC and Procirca faculty. Dr. Borovetz said this was the first group of students from his distance learning course to visit Pitt and the Procirca center, with plans to bring another group this fall.